It was a perfect LA Saturday afternoon. The exception being the Hooray-For-Me drivers on Santa Monica Blvd, but perfection is hard to come by. Happy Meal and I had a Groupon for Mel's Drive-In, and we were hungry for cheeseburgers. Parking at Mel's was a breeze--free valet! We chose the counter for instant seating. We ordered a couple of cheeseburgers, and Happy Meal ordered his very first float--Diet Coke with Vanilla ice cream. Our orders were up in about 5 minutes. 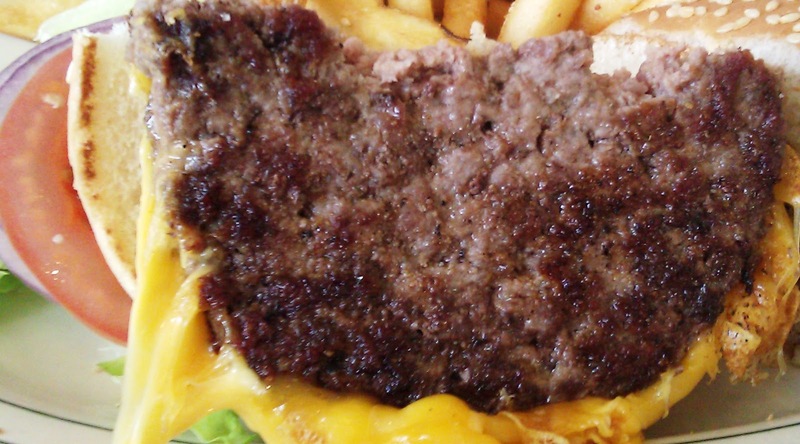 The Beef: Mel's Drive-In used 100% Chuck for their burgers. While I made a point of ordering my burger Medium, it came out Well-Done. I really didn't want to argue, since I had already sent it back once for having the wrong cheese. That cheese (Cheddar) was partially scraped from my burger, and the American, which I ordered was just melted over the "used" burger patty. That said, the over-cooked burger patty was moderately beefy. The burger weighed in at 1/3 pound. The fat content had to be near 25%. The burger patty was not juicy, but it was on the dry and greasy side. There was no trace of minerals or aging. The bite was firm without being chewy. The beef was slightly below average. The Seasoning: The burgers were nicely seasoned with a salty blend. The seasoning was solid. The Sear: The griddled sear on the burgers at Mel's Drive-In was crisp, dark, and even. The bites near the edge provided a firm crunch, and that coupled with the toasted texture of the bun, were particularly satisfying. The Preparation: Meh. The burger was over-cooked. Instead of a re-fire, the incorrect cheese was simply scraped off of my burger. The uniformly round patties were formed with medium pressure. 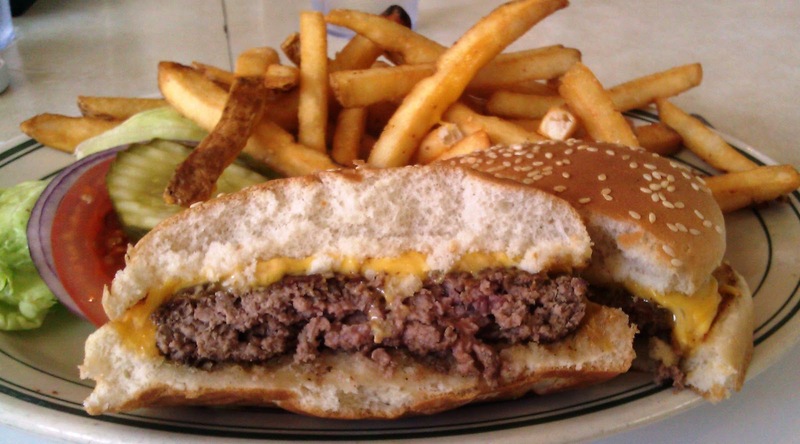 The Cheese: Mel's Drive-In applied 2 slices of American cheese to its cheeseburgers. The cheese was perfectly melted. It was creamy, savory, and satisfyingly gooey. The cheese picked up the slack where the beef was too dry. The cheese was the hero in this cheeseburger. The Bun: The seeded bun was nicely toasted and mercifully unbuttered. The bun was mildly sweet. It was about a day past its prime, but the cheese filled in like a champ. The Meat To Bun Ratio: A 1/2 pound burger would have been a better match for the Mel's Drive-In bun. The Toppings: The Iceberg lettuce was fresh and crisp. The tomato slice was ripe and juicy. The Fries: Mel's Drive-In served up some competent, peel-on fries. The seasoning was meager, but the color and crunch were strong. The Value: A 1/3 pound cheeseburger was $7.95...ouch, and a ice cream float was $4.95...double ouch. The pre-Groupon total for our meal was $24.58. This was an overly steep price for a very average couple of cheeseburgers. 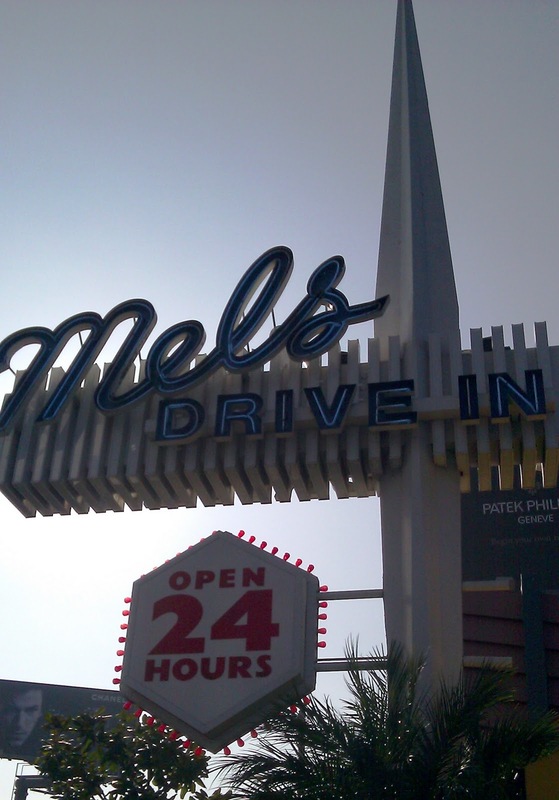 Mel's Drive-In served up pricey food with little regard to quality. Burger Review : Over-priced mediocrity at Mel's Drive-In in West Hollywood.